Dubai: S.R. Shenoy has just been declared winner of $1 million cash prize at a raffle draw in Dubai, and his luck could not have come at a better time. The Indian expatriate, 37, has mounting debts to pay. In the nine years that he’s been away from his home country, he has racked up approximately Dh230,000 to Dh240,000 in loans and credit card bills. He has been religiously buying raffle tickets every month for four years now and it's the first time he has won. But while he has finally hit the jackpot this time, he will be taking home only a portion of the prize. “I buy tickets regularly and I always split the cost with my colleagues, so the $1 million will be shared equally with them and I will get only Dh360,000. It's still a big amount and I'm thankful for it," he said. He also doesn't mind that he's invested quite a bit of money in raffle draws. Shenoy spends about Dh100 a month on Dubai Duty Free tickets, and for four years, he has shelled out Dh4,800. That doesn’t include the money he’d occasionally forked out to join another raffle draw in Abu Dhabi. Although he is not married, Shenoy is the sole breadwinner in his family, so it’s been a tough act for him to make ends meet. Consequently, he has incurred balances on some credit cards. He has also taken a personal loan in Dubai to purchase a parcel of land in India, and signed up for another in his home country to pay for the construction of a house. He currentlly owes Dh150,000 in personal loan and some unpaid credit cards in Dubai. "Back home, I owe Dh80,000 to Dh90,000 in debt, so there won’t be much left of the prize money, but it’s still a blessing from above. At least I can settle my debt,” Shenoy told Gulf News. 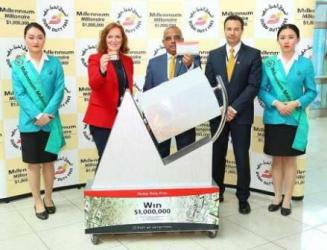 Dubai Duty Free also announced three winners in its luxury car and motorbike promotions. A Saudi national, Abdullah Alkhaldi will be driving home a BMW 750Li in Series 1683. He had purchased his lucky ticket on March 21. The second vehicle, a BMW S1000 RR motorbike in Series 333, will be awarded to Tina Serrao. She has been a resident of Dubai for 13 years now and works as an executive secretary for a trading company.